It’s almost Valentine’s Day and we all know what a huge day this is for weddings! Many brides having a Valentine’s Day wedding will at some point be looking for Valentine’s Day wedding cakes. 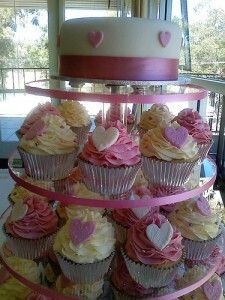 I found some very creative, beautiful wedding cakes, cupcakes and cake pops (or cake balls!) with heart themes that I thought I would share! Any of these delightful pink, red and white edibles would be stunning hits at any Valentine’s Day wedding, party or event. 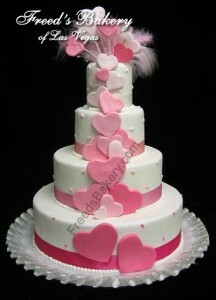 This rolled fondant cake from Freed’s Bakery is decorated with pretty pink and white hearts. I love the added flourish of fluffy pink feathers on top! These heart themed pink and white cupcakes were found on flickr by American Candy Stand Cupcakes. They look mouthwatering! The cut out hearts and foil cupcake liners really make them pop. I love how colorful this heart themed pastel fondant layer cake is found on flickr by She Takes the Cake. 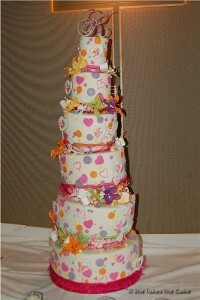 The rainbow of bright pastel colors pulls your eye right to this centerpiece of a wedding cake. It is so gorgeous and yet so fun! Since cake pops (or cake lollipops) and cake balls are all the rage right now I also found some delicious looking Valentine’s Day Heart Themed Wedding Cake Pops that would make yummy Valentine’s Day wedding favors or wedding day treats! You can either find a local baker to make some for you or you could try your hand at making them yourself using the tutorial I recently wrote up on DIY Weddings by Wed-Central. Go check it out! These cake balls found on flickr by herocakepops are so pretty! 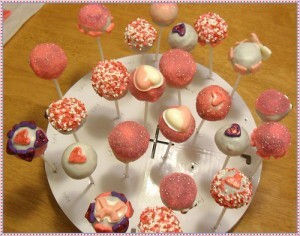 There are pink sparkly cake pops, heart themed cake pops and even what seems to be xoxo cake pops too! 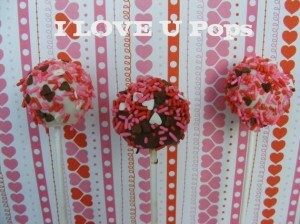 You can buy these delicious looking valentine heart themed cake pops on etsy from cakepopshoppe. She calls them I love you Pops! I love how they used what looks like white and dark chocolate with the heart sprinkles. Yum! She has all kinds of flavors to choose from if you decide to order. From your basic vanilla or chocolate cake with your choice of frosting to yummy red velvet and strawberry flavored too! 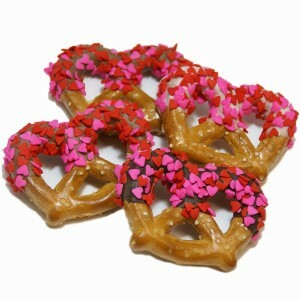 They are pretzel twists dipped in your choice of milk, dark or belgian white chocolate and then sprinkled with cute pink and red candy heart confetti. You can choose one of those delicious chocolate favors or a variety of all of them. 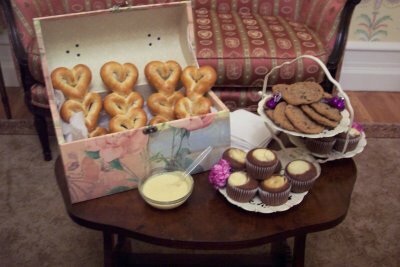 Whether you are having a Valentine’s Day wedding or a heart themed wedding, these chocolate sprinkled pretzels would be a perfect edible favor for your big day. Yum! 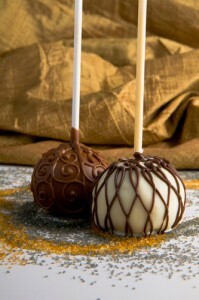 I found these delicious looking brownie/blondie pops on beau-coup.com. 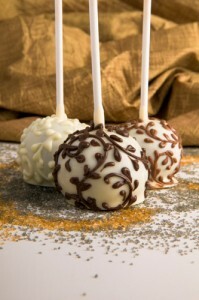 These yummy favors are chocolate wedding pops with a freshly baked brownie or blondie center. There are a variety of different intricate styles, including a bride and groom, filigree, vintage and scrolls. You even get to choose between white chocolate and milk chocolate coatings. I can’t believe how beautifully detailed in chocolate each little pop is! After you’ve decided on the edible details you can customize each pop with one of five ribbon styles and choose whether you want them packaged individually or as pairs. I can’t believe it’s almost the Winter Solstice and the Holidays are here! Surfing around online I was in a festive mood and couldn’t help browsing around for snowflake themed edible goodies. 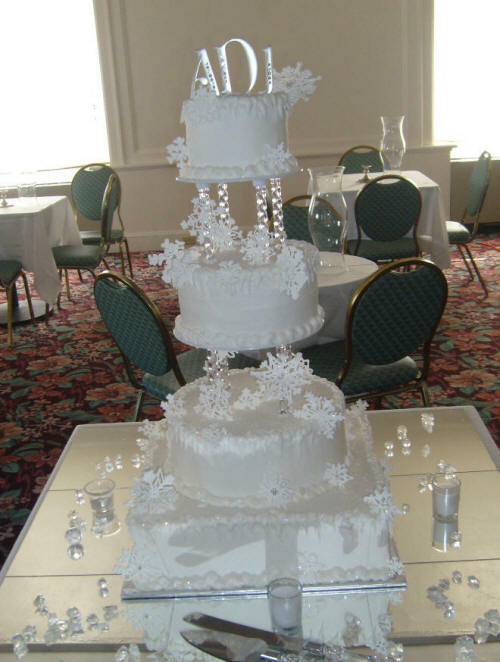 I came across some stunningly beautiful snowflake wedding cakes and just had to share! They would be perfect for you winter wedding brides looking to dress up your reception with delicate snowflakes. 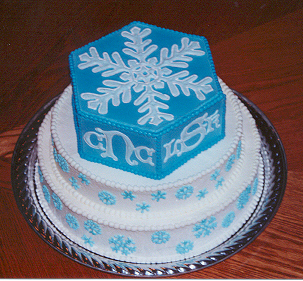 The next snowflake themed cake I found was from the Cake Guru. 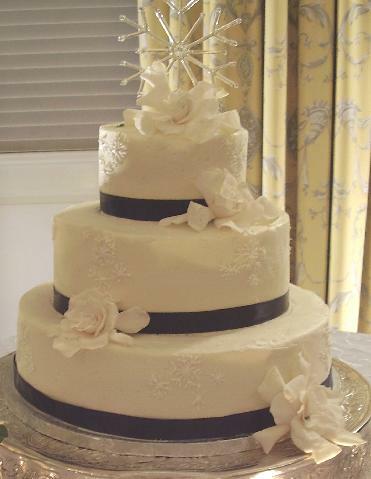 It is a pure white four tier wedding cake that seems to be frosted in sugary sweet butter cream for a satin finish. A few of the tiers stand on pretty white and transparent seperators making the tiers look like they re almost floating. 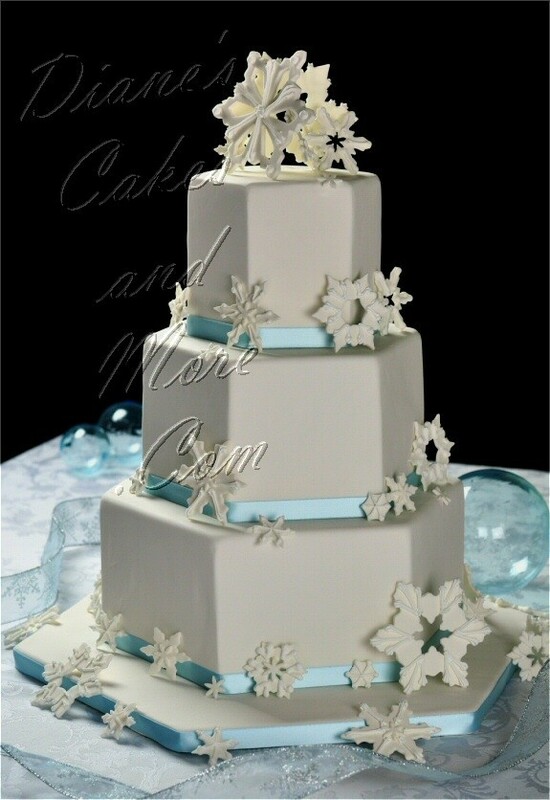 Beautiful intricate snowflakes adorn the entire cake for a beautiful winter look. Yum. Another stunning snowflake cake that would be perfect for a winter wonderland theme I found was from Good taste cake designs. They creatively combined intricate snowflakes and elegant white roses (or maybe gardenias?) on their 3 tier wedding cake. The cake looks like it is covered in smooth white fondant with deep blue ribbons of fondant dressing up the bottom of each tier. 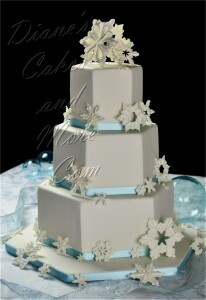 They also added delicate snowflakes in royal icing on the sides of the cake to continue with the winter theme. Sooo stunning! The last cake I will share with you today that was decorating with beautiful snowflakes is by Linda Salamon. It is a small simple three tier wedding cake but it’s simplicity stops there! Linda covered the cake in blue and white fondant and and added intricate blue and white sugary snowflakes and monogrammed letters. It’s so pretty and colorful! Chocolate is probably high on the list of edibles for many of your guests…so you can’t go wrong with chocolate edible themed wedding favors! 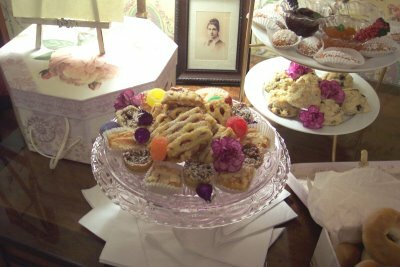 None of the favors will be left behind if you choose any of these delicious goodies for your big day! 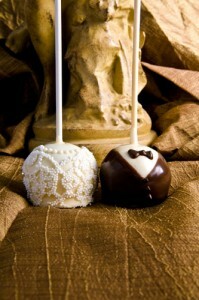 The first chocolate favor I found are chocolate wedding truffle favors from favorstudio.com. Each chocolate is boxed in an elegant brown gift box with a ribbon in the color of your choice..a very classy look! 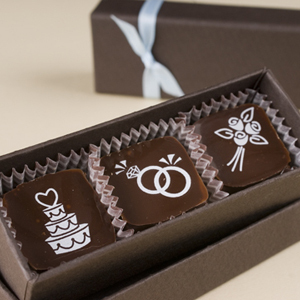 Peek inside and each box contains three adorable handmade gourmet chocolates decorated with classic wedding icons – wedding cake, rings and a rose bridal bouquet. You also have the option to choose either milk chocolate or dark chocolate. 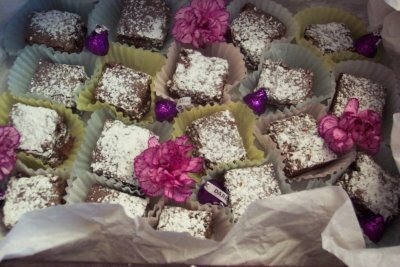 I’m sure these delicious edibles just melt in your mouth! Another gorgeous wedding edible for favors are chocolate covered oreos. Each cookie is dipped in gourmet chocolate (milk, dark or white! 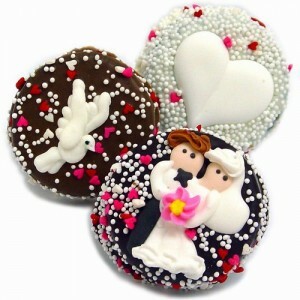 ), decorated with royal icing with a wedding theme, sprinkled with candy sprinkles and individually wrapped. I found these at littlethingsfavors. While searching the web this week I found a whole slew of yummy pear goodies that would be absolutely perfect for those of you with a pear themed wedding (The Perfect “Pair/Pear”!). I didn’t know there were so many different delicious ideas for this fruit themed wedding! 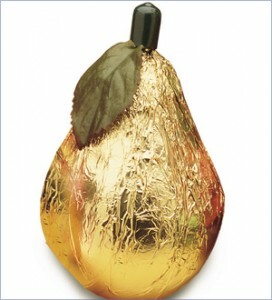 The first edible I found is a Chocolate Dipped Pear favor by Burdick Chocolates. 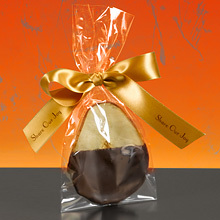 Each favor consists of a paper thin pear slice dipped in dark chocolate. They are wrapped in a cellophane bag and tied with a silk ribbon that can be personalized with a custom imprinted message. They are delicate and classy and sound like they would be sooo good! 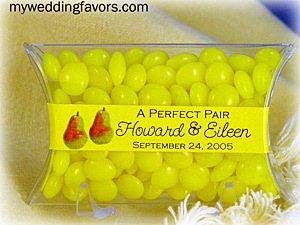 Another pear themed yummy I found that would be fantastic for your wedding day are Chocolate Pear favors. Each chocolate is wrapped in colored foil. I think they are absolutely adorable and who doesn’t love chocolate?? These edibles were found at Favors by Lisa. Another wedding favor I found that would be perfect for your Perfect Pair wedding theme are candy pillow packs filled with candy and personalized with a perfect pair themed band that can be customized with your own special message. You even get to choose the band color and the candy that will be inside the pack! The pillow packs were found at My Wedding Favors. Ebay finds: Autumn Wedding Favor Edibles! I found these two yummy finds on ebay! They are both from the ebay seller armani1031, and would make perfect delicious fall wedding favors for your big day! The first are personalized autumn themed coffee or tea favors – a favor your guests definitely will not leave behind after a night of fun and dancing at your reception! 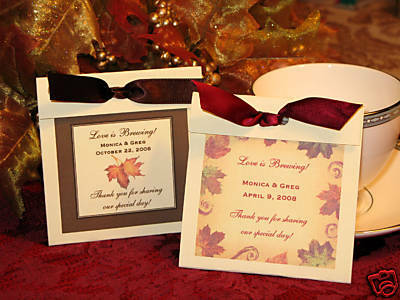 Each custom envelope is adorned with colorful fall maple leaves and tied with a soft matching bow. The seller works to personalize your favors to your liking – including working with you to choose colors to match your theme, the names and date to be printed on each pack. Visit their ebay auction list and search for maple leaves tea or coffee wedding favors! The other autumn themed favor I found is perfect because in most areas the weather is starting to get a little nippy. What would be better than a cup of warm hot cocoa with fluffy mini marshmallows? Armani1031 offers these stylish cones filled with cocoa mix, marshmallows and chocolate chips, personalized with a beautiful fall themed tag. Mmmn..it sounds so good I could go for some right now, I’m sur eyour guests will feel the same when they get home from the gathering. 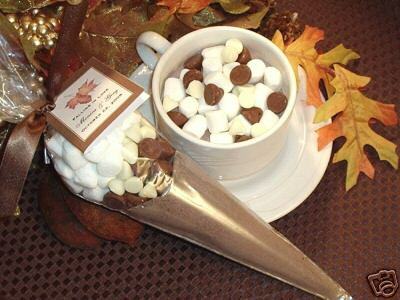 You can find these yummy favors once again by visiting armani1031′s ebay list and searching for “autumn cocoa”. Find any other yummy wedding edibles you think should be shown here? Please comment! Yummy Autumn Goodies Part 2! I posted previously featuring some yummy autumn/fall edibles for your big day.. I found so many fantastic autumn goodies last time I searched, I had to continue my delicious looking finds to another post! If you are having a crisp autumn wedding, here are some fall favors I think you will LOVE! 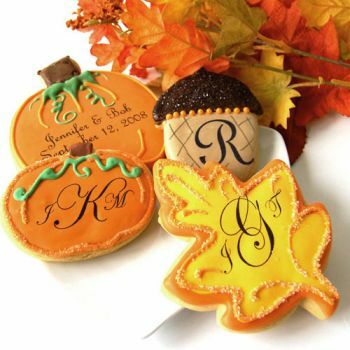 The first autumn edible favor idea I found were Personalized Fall Wedding Favor Cookies from “A Little Favor”. They are beautifully decorated sugar cookies in fall shapes like pumpkins, acorns and leaves, professionally frosted and sprinkled with beautiful detail! You can even personalize each cookie with initials, your wedding date or your names! Scrumptious! 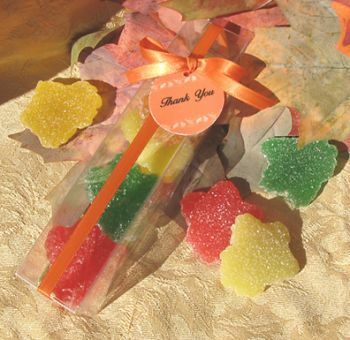 packaged in a plastic tube that is adorned with an orange ribbon with a thank you tag. The leaf candies come in four fall colors – red, yellow, orange and green. Another yummy find for a fall wedding favor I found were extremely unique festive candy apple kits from Simply Elegant Favors. 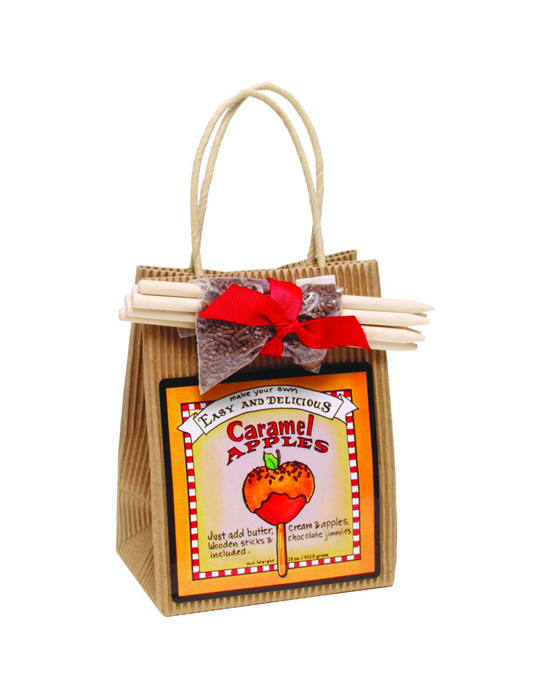 Each adorable tote bag contains caramel mix, 8 sticks and chocolate candy jimmies for your guests to go home and continue the autumn celebration by making their own candy apples! I know your guests would love taking home such a unique gift..I know I’d love one! Mmmmn, candy apples! Have you ran across any other wedding edibles I should blog about? Send me an e-mail! If you’re in the PA area and want some savory goodies on your big day, be sure to give Wedibles Catering a call!